Maharaj Kripalu, in his consolidation and revelation of Hindu philosophy, wrote the seven steps to God Realization enumerated above in the Prem Ras Siddhant. This book contains all of the philosophies of the Jagadgurus from the last 5,000 years, and focuses on the true meaning of human existence. A profound gift from the fifth Jagadguru, Our Spiritual Master's revelation of the philosophy of the soul or maya is explained in our own language for the convenience of all of us who do not know Sanskrit. By adopting humility, we form a foundation for true devotion, and devotion is a constant companion on the path to the seven steps. As the selflessness of an individual grows, the heart becomes purified with the fire of devotional love. This condition allows us to unite our souls with God. When Shri Maharaj Ji was 16 years old and left the Mangarh village to enter the Chitrakoot woods, he had the first experiences of his divine nature. For many days he moved in and out of Madhurya Bhao Bhakti (meaning ecstatic states in Sanskrit), and all who chanced upon him in his rapture considered the encounter a blessing. Such was his devotion that the lures of the material or mayic world had no power to distract him from samadhana (the graceful state of perfect concentration). To truly embed oneself in the path requires bhakti or selfless devotion. 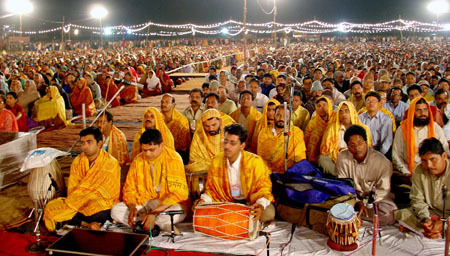 The ecstatic states of Shri Maharaj Ji's days in the Chitrakoot woods are the ultimate expression . We follow this example in our devotion and strive to constantly reorient our consciousness toward the divine spirit, love, or a teacher. Without this, our actions are as useless as the 'living' body without a soul. Maharaj Kripalu relates that the ultimate aim of all human life is to experience absolute and perfect happiness and love. We are all searching for this love every moment we are alive, anyway, even when we have lost sight of our quest for the path. In the end, everything we do is a search for happiness, and we do not rest until we find the love which we are seeking. These seven steps to God realization are a profound and thoughtful means to unlock this happiness in ourselves and for ourselves as we learn about the heart, the self, and love. Now we are ready to explore the seven steps of becoming in greater detail. We invite you to visit our other site at http://www.maharaji-kripalu.com to read about these steps in greater detail, and to learn how Maharaj Kripalu acknowledges each step.